Do you remember the first time you saw Back to the Future? Probably you do. It's just one of those movies. I saw it on opening weekend in 1985. In the final seconds, as Doc Brown's DeLorean zoomed toward the camera, its engine morphing into the start of Huey Lewis and the News' “Back in Time,” I felt a sense of euphoria that only a very few movies have ever provided. That's because Back to the Future is as perfect as a film can be. It's a rare case where everything came together just right: the story, the actors, the music, the script, and so on. Now, for the 30th anniversary of this classic motion picture, comes Back in Time, a documentary about the BTTF phenomenon. While hardly revelatory for diehard fans, there's nonetheless a lot of fun information provided here. The doc begins with a look at the making of Back to the Future. Director Robert Zemeckis, co-writer Bob Gale, producer Steven Spielberg, and stars Michael J. Fox, Christopher Lloyd, and Lea Thompson are among those who offer their memories, from inception to completion. A lot of this material is familiar, focusing on well-covered items such as the filmmakers' decision to replace original lead Eric Stoltz several weeks into production. (You do get a brief glimpse of Stoltz footage, which is cool, plus a promise from Gale that those scenes will eventually be made public.) The only notable figures not here are Tom Wilson (a.k.a. Biff) and, unsurprisingly, Crispin Glover, who famously fell out with Zemeckis and Gale over contract demands for the sequels. The whole team's on-camera reminiscences are enjoyable to hear, even if you already know the stuff they're talking about. For his part, Fox offers up a hilarious story about attending the London premiere and sitting next to Princess Diana, which ultimately proved to be an uncomfortable experience. From there, Back in Time looks at how the movie has reverberated in popular culture over the past thirty years. There's footage from an annual car show dedicated to DeLoreans, and we meet some people who have spent untold fortunes making their vehicles replicate Doc Brown's. A section devoted to Britain's “Secret Cinema” screening of Back to the Future reveals a fake Hill Valley built for viewers to roam around in prior to viewing the movie. There's even a detour into two companies working on making things featured in Back to the Future Part II: one of them has developed an actual hover board, the other is working on a flying car. The footage of both is astonishing. From these, and other, moments, Back in Time makes it clear that BTTF is more than just a movie; it's something that has captured the public's imagination. Director Jason Aron has a little trouble with organization. Back in Time tends to bounce around from one thing to another, with transitions in subject that feel somewhat random. Still, he gained interviews with almost every person associated with Back to the Future, getting them to speak candidly, and also captured a wide swath of the movie's afterlife through fan response and events that have been inspired by it. Seeing all the ways this franchise continues to make an impact is incredible – more so because the folks who made it obviously never anticipated the reaction and are continually grateful for it. Anyone to whom Marty McFly and Doc Brown mean something will doubtlessly enjoy this engaging inside look at how BTTF has impacted other fans. With Back in Time, admirers of Back to the Future now have a terrific new way to continue celebrating a film that has more than earned its status as a classic. 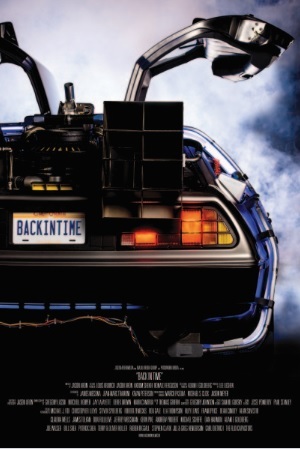 Note: Back in Time is on VOD, DVD/Blu-ray and select theaters starting October 21. Back in Time is unrated, but contains some adult language. The running time is 1 hour and 35 minutes.